In my summer blog series, 3 Resources I’m Loving, I’m sharing my favorite 3 resources at the moment for different purposes! Check out my last post about Summer Visuals. September means back to school, which also means that it’s finally PIANO LESSON TIME! I’ve been having a blast creating new visuals, songs and activities to support my adaptive piano lessons and have really found myself excited to teach piano–something I never thought I’d say. I spent most of my days as a student avoiding the piano like the plague (no, seriously–you wouldn’t believe the excuses I’ve given to avoid playing it in public! ), but have really fallen in love with it over the past year. I use the piano daily in my music therapy sessions and have been feeling totally inspired for all the lessons I’ve been teaching. 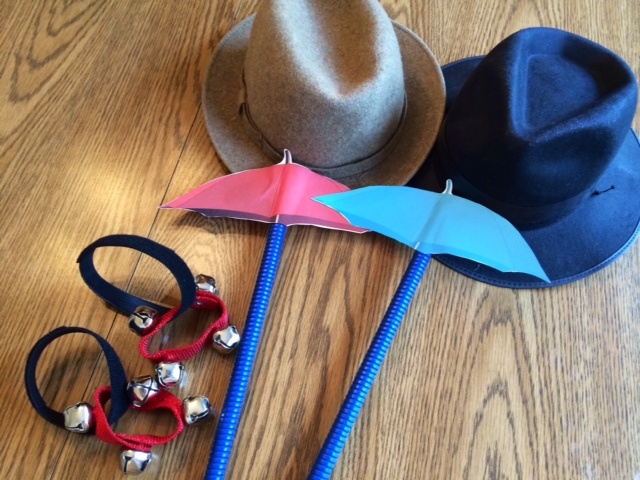 I thought I’d share 3 of my favorite things to use right now in my piano lessons. 1. Hand/Desk Bell Set. GUYS. If you don’t have a handbell set or xylophone, go get one right now!!!!! 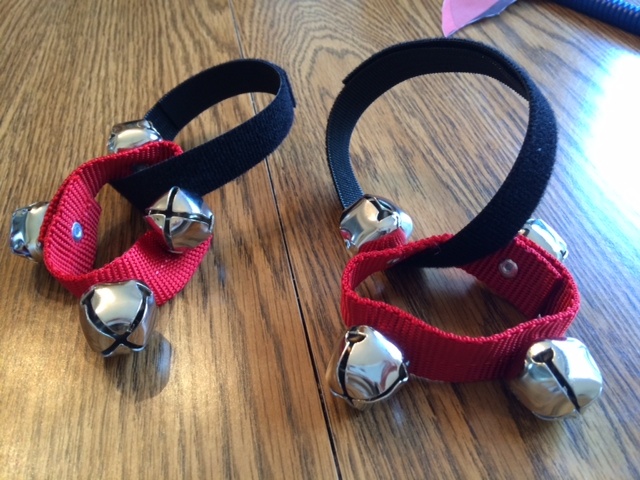 These bells have been a huge source of motivation for my kiddos. 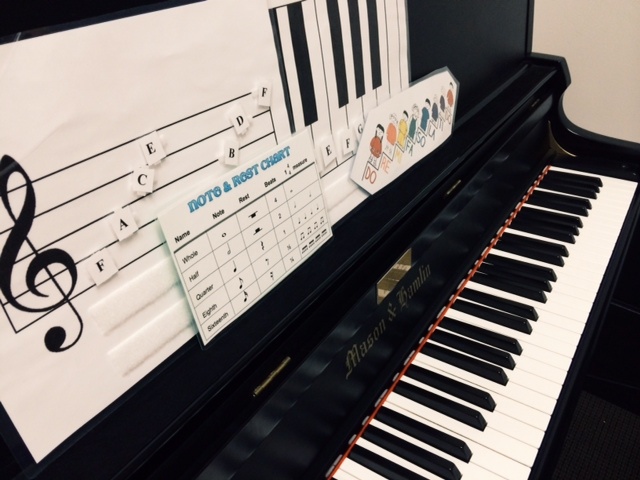 Beginning students can use them to play their songs, learn solfege and practice note identification. It’s super easy to color-code visuals to match (I have little fish I like to use…this is also great for working on color matching, visual tracking, etc). 2. VISUALS! LOTS AND LOTS OF VISUALS! I can’t stress this enough–a good visual can totally make or break teaching a new concept. I have basic piano keys/staffs with velcro to work on note learning and identification, rhythm value cheat sheets, solfege visuals and more. 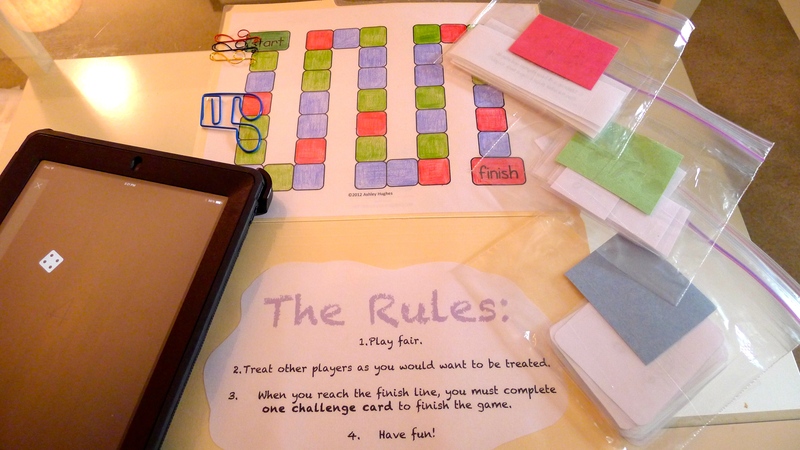 For some quick downloads, see the post about my much-requested lesson game, Miss Kerry’s Musical Melee, and click on the links for the rhythm and note cards. 3. FUN APPS! For new piano students, I highly recommend Tune Train. 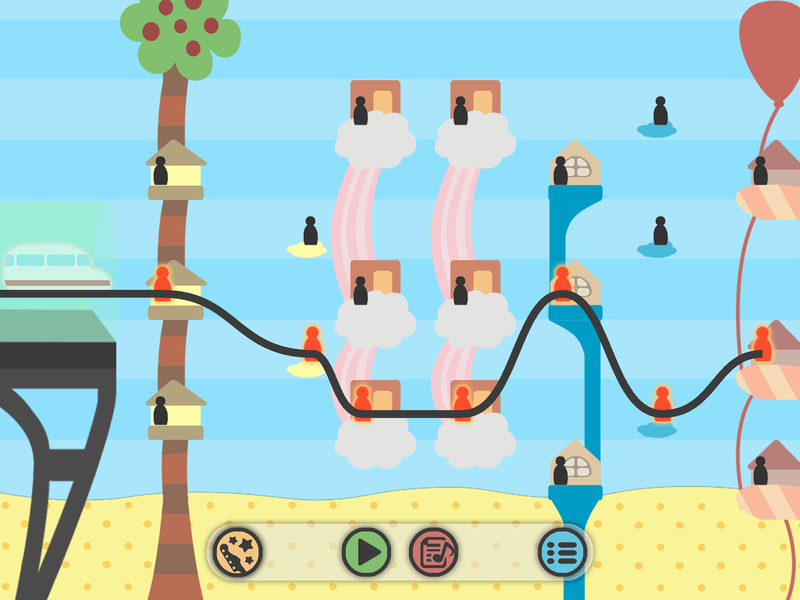 Your students will looooove composing their own song by extending the train track and hearing it played back to them paired with different musical styles (hip hip, pop, classical, etc). It’s a great way to introduce concepts like harmony and pitch while also working on fine motor skills (isolating one finger to draw the line) and decision-making. Other fan favorites are Flash Note Derby and NotateMe Now. For many of my adapted piano lesson students, sitting at the piano for 30 minutes can be really challenging. I always try to keep our sessions fun and engaging by bringing in other instruments like desk bells or boomwhackers, getting up and moving around or even playing games! 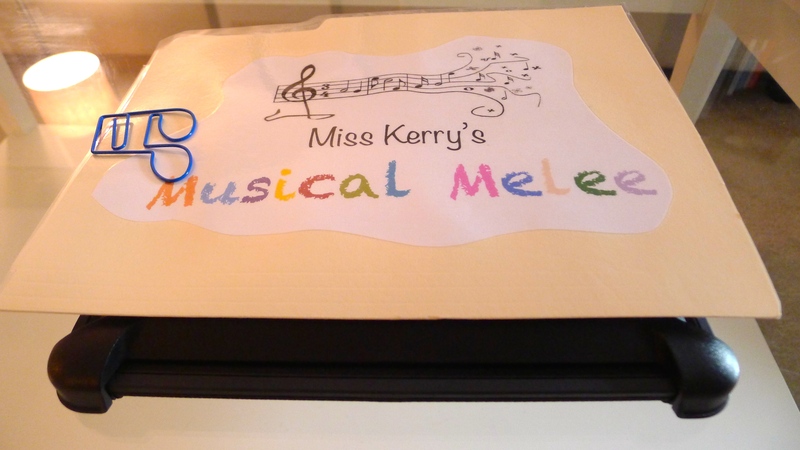 My latest creation, Miss Kerry’s Musical Melee, has been an absolute hit with my clients and is now something they ASK for at the end of our sessions. The rules? Players roll a dice and select a card based on the color of the space they land on. 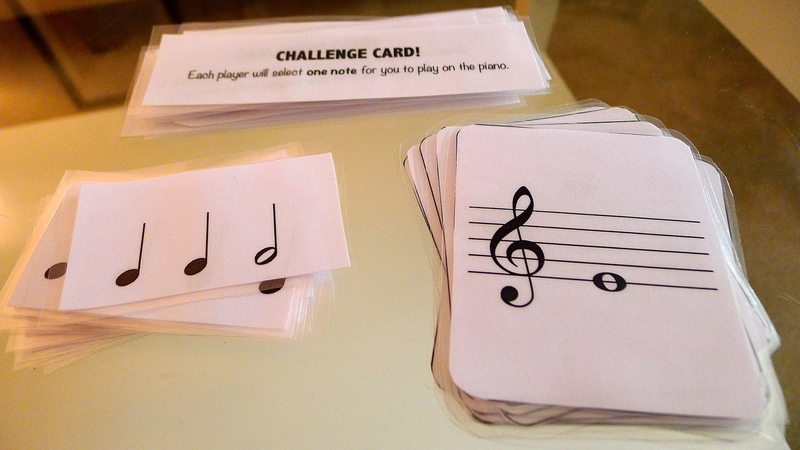 Cards will prompt players to clap rhythms, ID note names or complete a challenge card (i.e., play notes on the piano, sing their solfege, compose a 4 beat song). When players reach the end of the board, they have to complete one challenge card to finish the game! I liked this game board template at The School Supply Addict and decided to color it in myself to match the construction paper I had on hand. However, if you google “game board templates” you’ll be able to find a bunch to suit your needs, whatever they may be! I used these basic rhythm flashcards found at Susan Paradis: Piano Teaching Resources because they were cute, small and portable. You could also try these rhythm cards found at Layton Music. 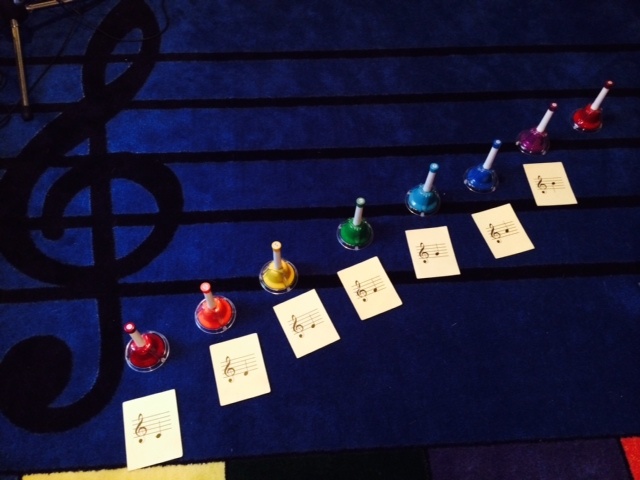 I also used these music note ID flash cards from Making Music Fun, and plan to repurpose them for all of my music lessons. **FREE ALERT! ** I made my own challenge cards, rules sheet and cover page, which you can download for FREEEEEEE here: Miss Kerry’s Musical Melee. If you’re a traveling music therapist like me, you’re going to want your game to be compact without a lot of pieces. Divide your cards up into Ziploc bags, clip them into your file folder (bonus points if your paper clips double as your playing pieces!) and download a Dice App like this one. Now, you’re ready to go! Miss Kerry’s Musical Melee is definitely a beginner level game, but it could easily be adapted for any skill level or age by increasing the difficulty of the questions and topics covered. Feel free to adapt as needed—I’d love to hear how you use it with your clients. HAVE FUN! 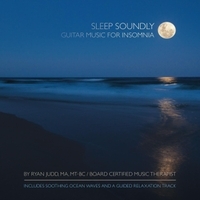 This time of year, I love to use weather-related songs and activities in my sessions! Springtime weather always inspires me to break out my ambient instruments (frog rasp, crow sounders, canary sticks, rain sticks, thunder tubes, etc) and use songs about sun, rain and flowers. One of my fan-favorites from this season has been a movement activity paired with “Singing in the Rain” that gets everyone moving and has lots of opportunities for some feel-good solos. When I introduce the activity, I usually show clients pictures of Gene Kelly dancing (quite adorably) with the light-post or a brief video, if possible. I mean, how cute is he?! Clients are then invited to volunteer for a “tap dancing” solo in front of the group. I usually model some snazzy moves (turning in a circle, kicking my feet out, jazz hands) but you’ll also love seeing what your clients come up with on their own. 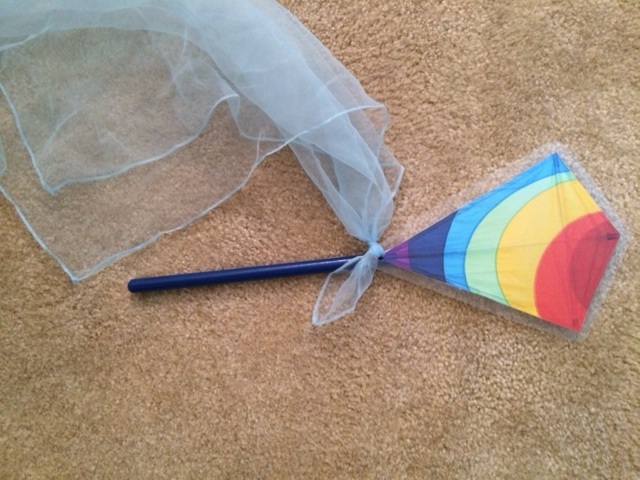 I made a few portable umbrellas (gotta love those multi-purpose rhythm sticks!) and dug out two very suave costume hats for clients to hold and wear. 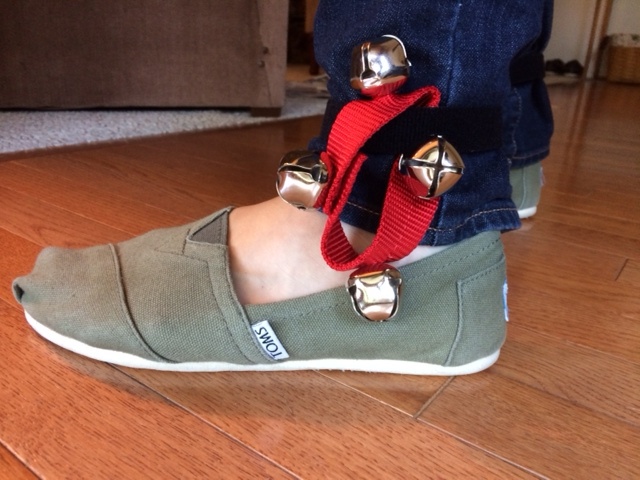 For some groups, I attach jingle bells to self-adhering Velcro tape (my bells too small to fit around adult ankles) and invite clients to wear or hold them during their solo. Because some of my adult groups have high numbers of hearing and visual impairments, I’ve found that this is a great way to motivate clients to move and participate, even from their seats. For everyone else, I love Gene Kelly’s classic rendition! If you have lots of staff to help and don’t need your hands free, you can even play it live and vamp during each client’s solo. Have fun!